Isn’t it a little late to be nesting? As you might remember, my Photo of the Week last week was an image of a fledgling meadowlark I’d found in mid-September. At the time, I’d talked about how surprised I was to see such a young bird so late in the season. Well, last Friday, Eliza Perry, one of our Hubbard Fellows, called me to say she’d just found a nest full of tiny birds – did I want to come take a look? Of course I did. American goldfinch chicks sit in a nest about three feet off the ground in a tall thistle (Cirsium altissimum) plant. Platte River Prairies, Nebraska. I’m pretty sure what Eliza found was an American goldfinch nest. The bills and markings on the birds look right, and we spotted an adult goldfinch nearby. 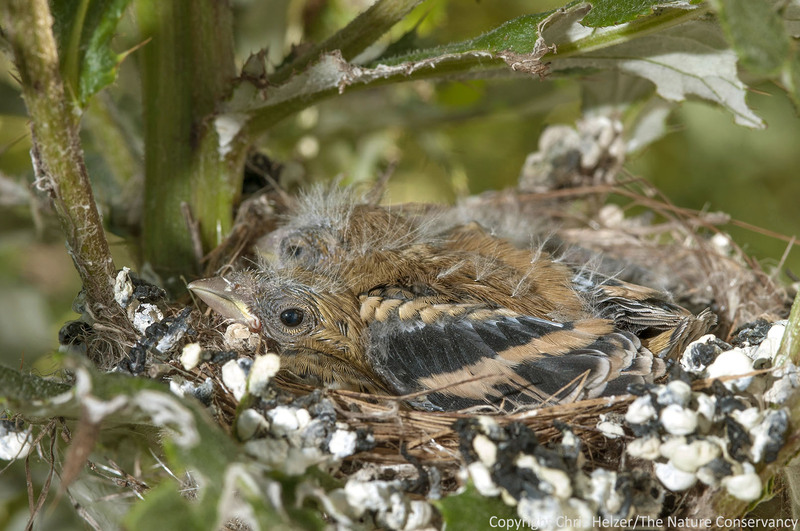 However, the best supporting evidence was that the nest was located in a thistle plant (a native thistle species, by the way) and had thistle down in the nest cup. There is a strong tie between American goldfinches and thistles. Unlike most other bird species which feed their young on insects, goldfinches instead feed them regurgitated seeds – especially those of thistle plants. In fact, they often delay their nesting until those thistle seeds have ripened. Here is a link to photographer/naturalist Stan Tekiela’s post on this topic, if you’re interested in learning more about the topic. These birds are even further behind the meadowlark in their development, and it’s already getting pretty cold overnight, so the nestlings’ chances for survival might seem slim. Of course, the difference between the meadowlark and the goldfinches is that the goldfinches have adults around to help them. Both have a challenging fall and winter ahead of them, but nothing others of their species haven’t dealt with countless times before, I guess. 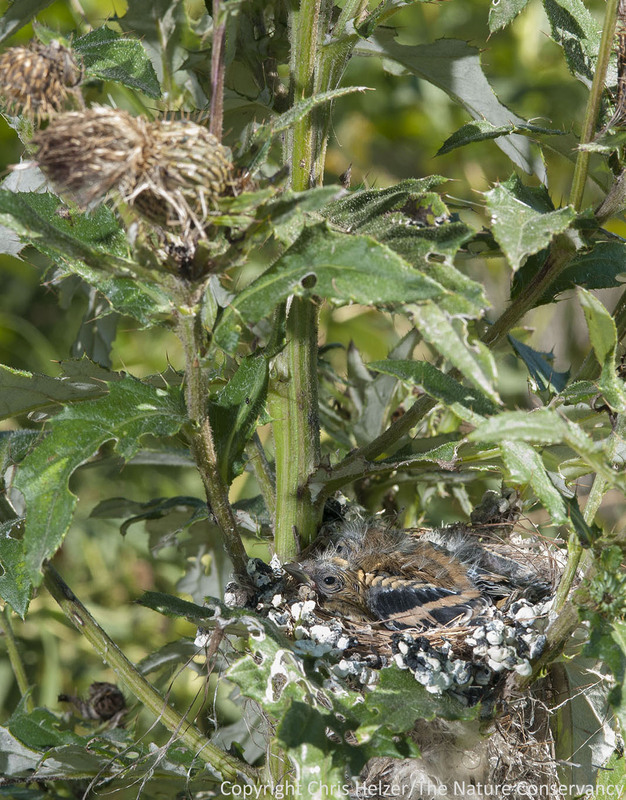 A better view of the nest placement within the tall thistle plant. Thanks to Anne Stine, our other Hubbard Fellow, who graciously helped hold equipment for me as we photographed the nest. Because of the very bright early afternoon sun, I had Anne hold a diffuser near the nest to reduce the harshness of the sunlight while I held a small flash unit to better illuminate the birds. We worked quickly and got out of the way so the parents could resume their feeding duties.